As I've been linking to a number of good presentations lately, it's only fitting that I post some reviews on a few books I've recently covered on the subject. I ordered two of these on recommendations from friends. The third (the first review below, was based on Amazon's recommendations, and was a very poor impulse buy. Anyhow here they are. ...and then applies that to run-of-the-mill '4 points per slide, max 4 sub-bullets per point' powerpoint pablum! Yuck! Worse yet, short of a few points about looking your audience in the eye in between bullet-reading segments, there's very little on story-telling, story building, etc. 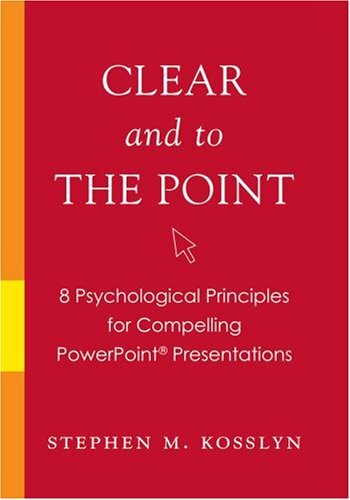 I would only recommend this book for the worst '8-point bullet eye-chart' type of powerpoint offenders. Otherwise, skip it. This book is much better. The book's author, Garr Reynolds, is former Apple employee and currently resides and teaches in Japan. Both influences show, as he is of the 'minimal text, maximum imagery' school of presenting that you see in Steve Jobs keynotes and elsewhere. I've blogged about this in the past (here, and here), and am definitely a fan of this school of presentation style. More importantly, Reynolds is adamant about properly preparing your ideas first, knowing what you are trying to say, to whom, and how, before ever touching the PC. I also agree with this whole-heartedly, and often find myself telling coworkers to do the same (when they are neck deep in borrowed slides from other people and unsure what it is they are trying to say). If there's one downside to the book, its that so much of it is borrowed and/or reprinted from elsewhere, much of it online, that I felt like I'd already been through half of it before ever picking it up. Much of it was deja-vu. Still, I recommend it. This was something a friend pointed me to, and I have to say I'm glad he did. 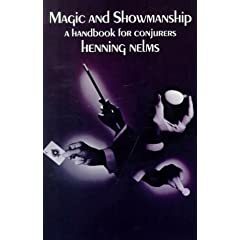 This is a book for professional or aspiring magicians/illusionists. What does that have to do with presenting? A lot! The book spents some time talking about the mechanics of magic tricks, but far more on the theatre of magic. The story arc in a trick, the careful direction of audience attention to something while the orator prepares to surprise them from another direction. I found it to be both enlightening and useful. Recommended. Hey Hollywood, what's that behind you? I'll play "litigation" for a bingo!